Ten common skincare mistakes and how to fix them. You probably be surprised to learn how many people stick to their skincare routine simply out of habit. Day in day out the same actions but no results. Here are 10 of the most widespread mistakes you can make when it comes to taking care of your face. By the way, don't miss out on our bonus that will tell you about the benefits of a banana peel for your skin. #10. You change your cosmetics too often. Let's all admit that it's not easy to resist purchasing another face cream or serum. Magazines keep showing us endless compilations of the best beauty products of the season and cosmetic stores add fuel to the fire by announcing discounts in sales. However, you need to be strong. Try to do your best to resist temptations especially if you already have several items at home that suits you perfectly. Some people are afraid that their skin will become accustomed to their favorite beauty product and will, therefore, stop having any effect. That's why they keep changing cosmetic items. But these people aren't aware that their efforts are in vain. Your skin doesn't adjust to skincare products over time and more importantly unfamiliar cosmetics should be bought with caution. A newly bought cream can easily become the reason behind an allergic reaction. Also Read: What Your Hair Can Tell You About Your Health? #9. You use a facial scrub on a daily basis. Human skin has a wonderful ability to regenerate without any extra help. Yet people still use scrubs and peels to speed up this process. It's true that scrubs can't help your skin peel faster and it can also cleanse it and make it smoother. But if you perform this procedure on a daily basis you risk depriving your skin of its protective layer. This is especially dangerous for dry and sensitive skin. The wrong scrub can do more harm than good. Generally speaking scrubs and rough brushes are not the best products for cleansing your face. The perfect solution can be to replace them with light chemical peels and they don't have to be expensive procedures at beauty salons. Nowadays, there are many items for home use that can softly and painlessly remove dead skin cells. #8. You don't use a makeup remover. In an effort to simplify your evening skincare routine. Perhaps you simply wash off your makeup or the dust of a large city with a cleanser or water. You might think you're saving a couple of minutes of your precious free time but in fact, you're unwittingly harming your face. Water in simple cleansers doesn't remove all of the cosmetic particles from your face. This can lead to clogging of forests acne and an increase in the oil content of your skin. So before washing your face, it's better to use a makeup remover like on micellar water cleansing oil or cleansing balm. They aren't just pretty in useless bottles eager to enter your wallet. These cosmetic products are vital if you want the best for your skin. #7. You use the same pillowcase for more than two days. Even if you wash your hair regularly and thoroughly cleanse your face every evening before going to bed. Your pillowcase still needs to be changed more often than once every 2 weeks. #6. You don't use a toner. A toner is a cosmetic product that restores the pH balance of your skin. It prepares it for further procedures. Even your usual moisturizing cream works more effectively if it's used with a toner. This product is also replaceable after traumatizing procedures such as chemical peels. If you include a toner in your set of beauty care items, you'll most likely avoid such skin problems as dryness, irritation, and rashes. The main trick here is to find a product that doesn't contain alcohol. Otherwise, the situation will be exactly the opposite. #5. You use powder to remove the oily shine. Some people have oily skin. It can get extremely frustrating when your face shines 24/7 inviting products are of no help. This can be a serious issue in the summer which is when many reach for face powder to get rid of the shine. Unfortunately, it can't keep the skin matte for long. Especially when it's very hot outside. What it can do is effectively clog your pores. Instead of trying to disguise an oily shine with powder try knotting wipes. Admittedly, they won't provide a long-lasting effect but they will remove unnecessary oil from your face without adding extra stuff to your skin. #4. You correct your eyebrows before applying makeup. If you suddenly find extra hairs in your brow area or above your upper lip, leave them as they are until the evening. It's unlikely that anyone will pay particular attention to them. At the same time, vivid redness or inflammation at the spot of a plucked hair will be visible to anyone. No matter how much foundation you use. If you do decide to correct your eyebrows, wait no less than two hours before applying cream or cosmetics to the treated area. #3. You wash your face before taking a shower. Of course, you can wash your face whenever you feel like doing so. While you're taking a shower for examples. But you should remember that it's better to use a small amount of cleanser to wash your face again after you've finished your shower. The thing hair products often contain silicone, parabens, and other chemicals that make hair smooth and soft. Unfortunately, they aren't as useful for your face. Conversely, by staying on the skin they can cause irritation, redness, or worsen existing acne. That's why it's a good idea to remove cosmetics from your face before taking a shower. Give your face a final wash after you've rinsed your hair. #2. You don't apply skincare products before going to sleep. After you've worn makeup for the entire day, you might not want to have anything on your face at all. Some people tend to entirely avoid skin care products tonight because they believe their skin should breathe. In fact, your skin will restore itself much more efficiently if you apply a night cream, a serum, or a mask to your face before going to bed. The active substances contained in these products neutralize the negative effect of cosmetics. And help your face look fresh. #1. You don't use SPF products on cloudy days. It seems that anyone who cares about staying young and beautiful has already grasped the importance of protection from UV rays. But although a lot of people have started to use SPF products on sunny days. Not only at the beach but even in the city. Many of them still forget about sun protection on cloudy days. Unfortunately harmful ultraviolet radiation is always there. Even in cold Scandinavian countries. This is why it's necessary to protect your skin all year long. You don't need to use special sunscreen products when it's cloudy outside. Simply by a moisturizing SPF 30 cream and it will be enough for the health of your skin. Bonus: How banana peel help your skin? Very often, the solutions to skin care issues can be found in simple and natural things. Such as banana peel! This underestimated product has an impressive number of Beauty benefits. Banana peel effectively fights puffy eyes. Place the inner side of a banana peel over your eyes and keep it there for a few minutes. This product can help you reduce wrinkles by keeping your skin hydrated. Rub the peel on the targeted areas, rinse it off with lukewarm water after 30 minutes. 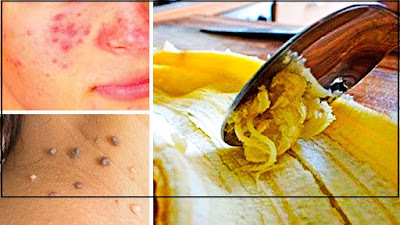 The banana peel treats acne and papillomas and removes warts. To achieve the best result you should rub the targeted areas for several minutes three times a day. If you need to get rid of warts rub the peel over the affected area and leave it overnight. Banana peel can even help whiten your teeth, just rub it gently over your teeth for a few minutes once or twice a day. Which of these skin care mistakes do you make? Are you going to change your habits? Write about your plans and ideas in the comments below.